January 26 and 27. 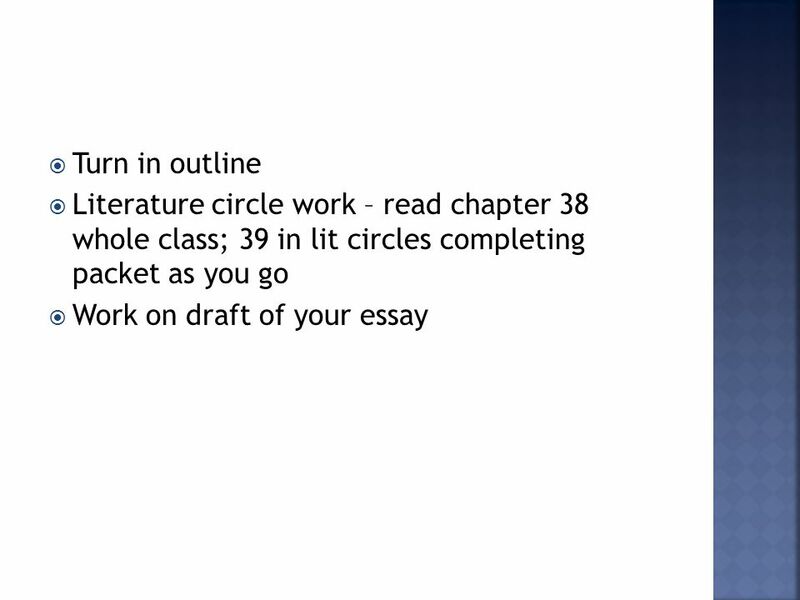  Turn in outline  Literature circle work – read chapter 38 whole class; 39 in lit circles completing packet as you go  Work on. 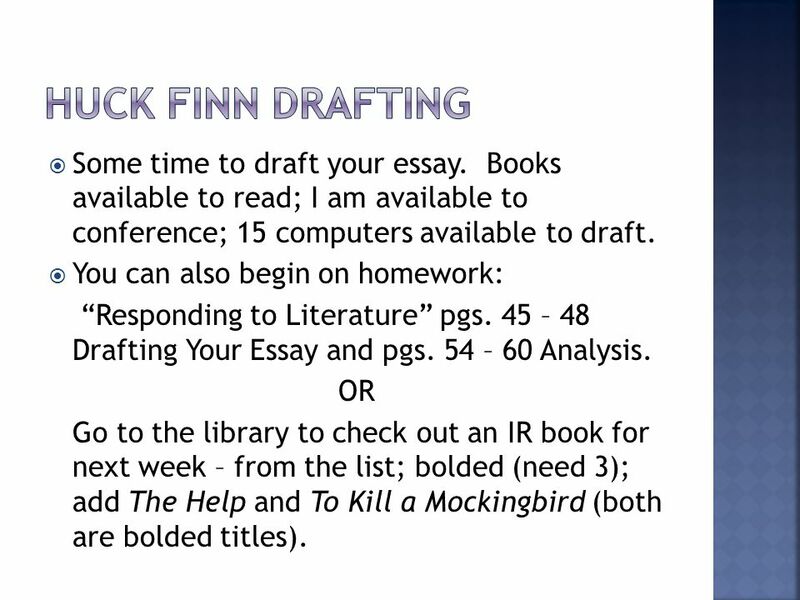 4  Get an IR book by Mon/Tues  Continue working on paper – research and drafting  A 4 – 6 page draft due on Wed Feb 1 (A)/Thurs Feb 2 (B). 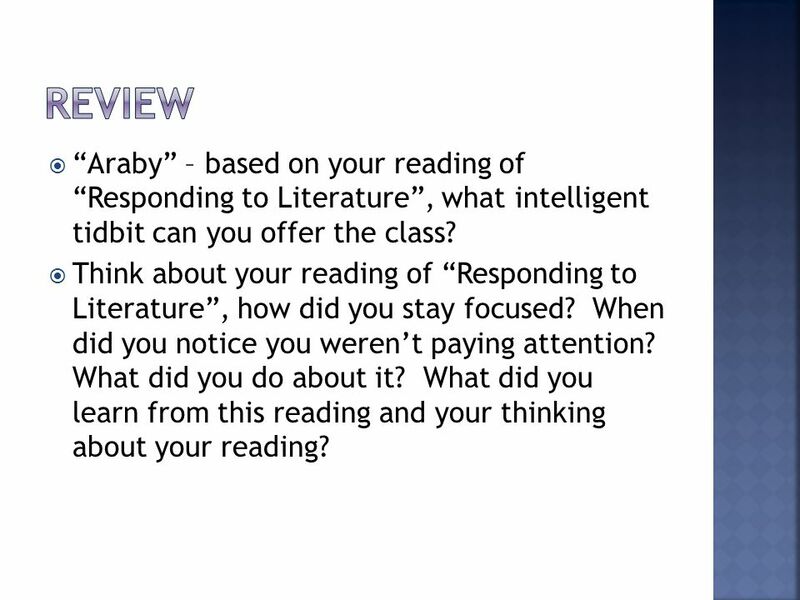 6  “Araby” – based on your reading of “Responding to Literature”, what intelligent tidbit can you offer the class?  Think about your reading of “Responding to Literature”, how did you stay focused? When did you notice you weren’t paying attention? What did you do about it? What did you learn from this reading and your thinking about your reading? 7  Brainstorm – you can work with a partner or two.  Complete as much as you can on the symbolism work sheet. 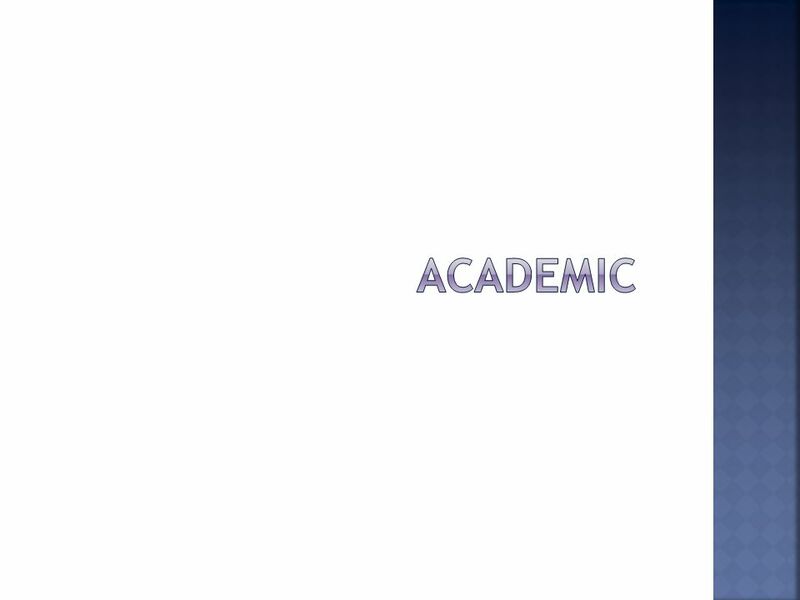 8  Some time to draft your essay. Books available to read; I am available to conference; 15 computers available to draft. 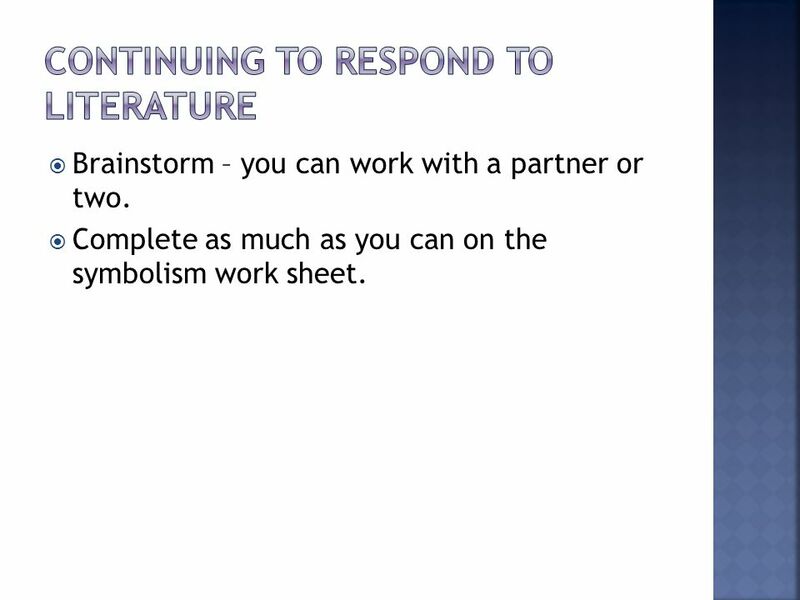  You can also begin on homework: “Responding to Literature” pgs. 45 – 48 Drafting Your Essay and pgs. 54 – 60 Analysis. OR Go to the library to check out an IR book for next week – from the list; bolded (need 3); add The Help and To Kill a Mockingbird (both are bolded titles). 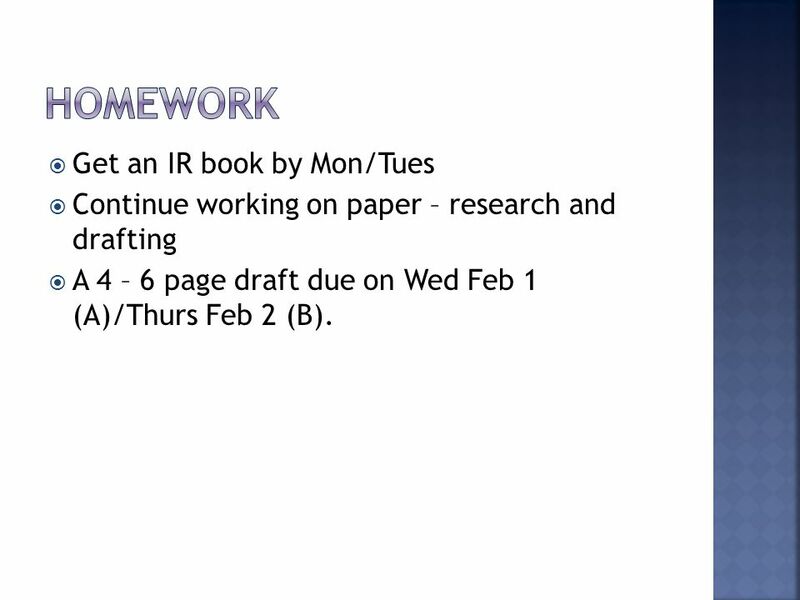 9  Get an IR book by Mon/Tues  Continue working on paper – research and drafting  A 4 – 6 page draft due on Wed Feb 1 (A)/Thurs Feb 2 (B). 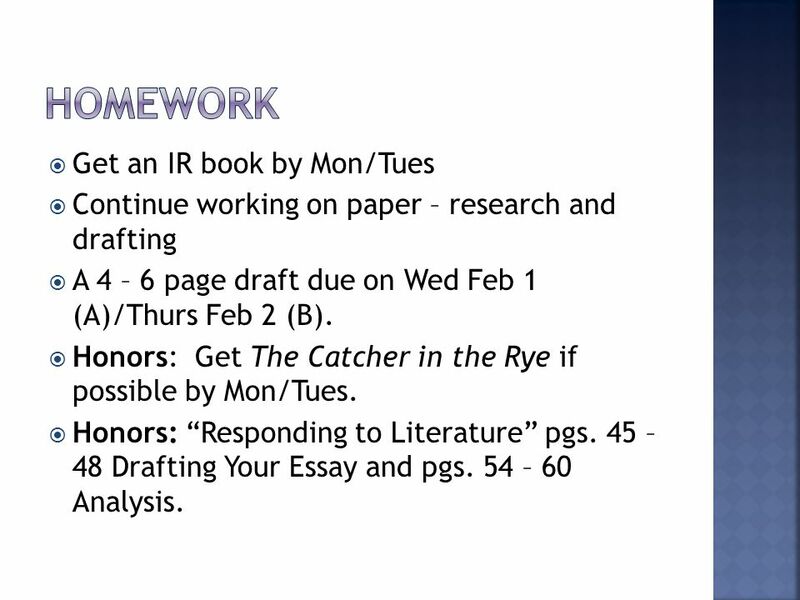  Honors: Get The Catcher in the Rye if possible by Mon/Tues. 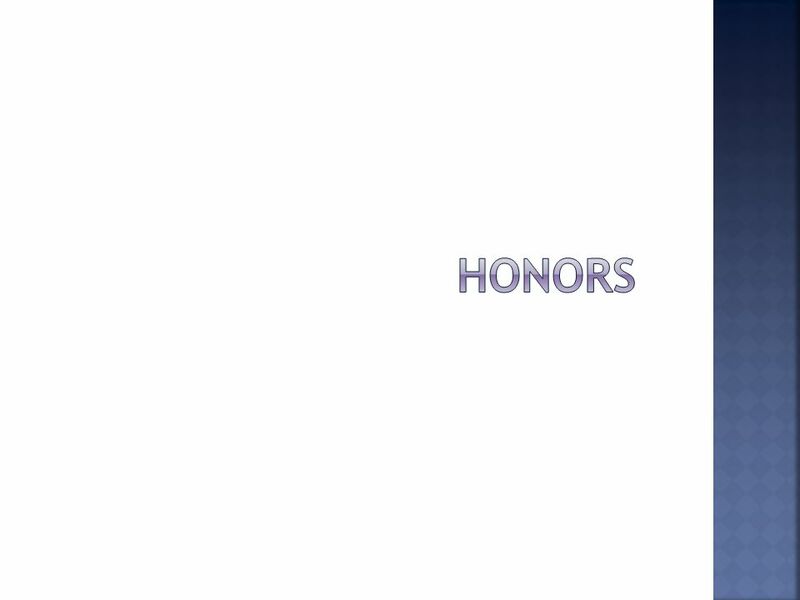  Honors: “Responding to Literature” pgs. 45 – 48 Drafting Your Essay and pgs. 54 – 60 Analysis. 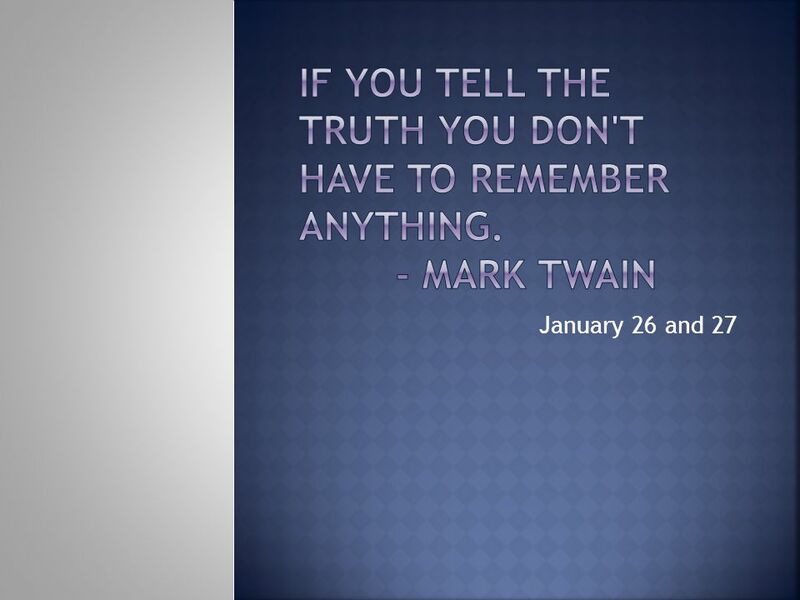 Download ppt "January 26 and 27.  Turn in outline  Literature circle work – read chapter 38 whole class; 39 in lit circles completing packet as you go  Work on." FRESHMEN DO YOU WANT TO BE A STUDENT COUNCIL OFFICER? INTENT TO RUN MEETINGS 8/23 at 6:45 a.m. in Forum 8/23 at 2:30 p.m. in Forum Applications accessible. English I Honors April 7, 2014 Bell work: Turn in Homework – Modern vocabulary usage from last week Agenda: •The Tragedy of Romeo and Juliet ••Finish reading. Bellwork Do the following problem on a ½ sheet of paper and turn in. Starter and Review: Mon., Sept. 26, 2011 Come in quietly, find your seat, be seated and begin starter. You will have 10 minutes after the tardy bell rings. Tues 3/18 1.LIGHT UNIT TEST – 2.Asst: Guided notes chapter 20 and 21. September 21 and 22. SSR Please turn in your IR packet to the turn in basket. You will get it back next class. SSR 15 minutes. SOLVING EQUATIONS WITH ADDITION & SUBTRACTION By: Erica Wagner Let’s get started! Let’s get started! Mon., Nov. 24 Eng. 10-A Starter So far, which of the Gothic Lit short stories intrigued you the most? Why? (2-3 sentences) Homework Study for Short Story. Learning Target: Learning Target: I can successfully distinguish between the branches of science and demonstrate proper use of the scientific method Wed.
Monday, March 30th THIS I BELIEVE. PLAN Mon – Journal + Film Clips – view and respond Tues – Journal Writing w/ Charlie Brown Wed – Writing Prompts and.  7:30 – 7:45 Grammar/Morning Show   7:45 – 9:30 MATH / READING (Group 1)  Whole Group  Centers   9:30 – 10:30 MATH/READING (Group 2)   10:30. HW: VOCAB DUE WED OBJECTIVES: TLW…  Identify persuasive techniques in text  Learn new vocabulary words using context clues  Use Microsoft Word to complete.